Icariin is the active flavinoid substance in the traditional Chinese medicinal herb Epimedium brevicornum Maxim. 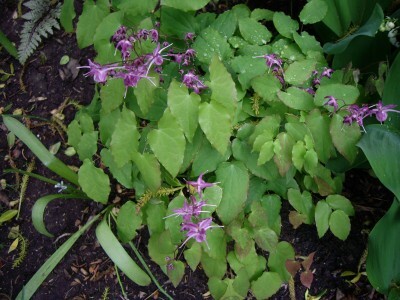 Icariin can be derived from several species of plants in the Epimedium family. These plants are known most popularly as Horny Goat Weed or Yin Yang Huo.” Although known and marketed widely in the United States as an aphrodisiac(ref), icariin and its sister epimedium-derived flavinoids have been subect to extensive research, mainly in China and elsewhere in Asia, and have been shown to exhibit amazing health-producing properties. A series of in-vitro and animal model studies have shown that icariin can promote the differentiation and proliferation of cardiomyocyte s and otherstem cells in multiple organ systems, act as an antidepressant, be protective of neural cells, inhibit the breakdown of bone tissue, stimulate the development of new bone tissue, inhibit the actions of several toxic substances, attenuate unwanted microglial activation, stimulate angiogenesis, have a powerful effect in regulating the immune response, inhibit the inflammatory response in arthritis and other inflammatory disease conditions, and reduce or reverse bone loss due to injury or arthritis. Icariin administration extends the lifespan and healthspan of nematodes. It affects expression in numerous signaling pathways including MAPK, IGF-1, BMP, AMPK, NF-kappaB, MEK/ERK- and PI3K/Akt/eNOS, and, potentially could be the basis for new treatments addressing cancers, arthritis, osteoarthritis, asthma, acne, Alzheimer’s disease — and the list goes on. Finally, yes: older rats systematically administered icariin do exhibit accelerated sexual activity. Other than for its sexual effects, icariin and epimedium are not well known in the US. The Pumbed datbase shows 241 research publications related to icariin and 344 related to epimedium, some of which overlap. Almost all of this research is conducted in China, a little elsewhere in Asia and Europe and almost none in the US. My purpose in this blog entry is to review this research and highlight what is known about icariin. I am grateful to my reader Louis who pointed me in the direction of epimedium in several comments to the blog entry In-vivo cell reprogramming for longer lives. Icariin is neuroprotective due to several different actions. tissue showed that IL-4 expression was significantly reduced (P < 0.05), while the exposure to high concentrations of corticosterone, particularly during chronic inflammatory and immune diseases. One of the main mechanisms underlying neuronal injury is apoptosis. In the present study the neuroprotective effects of icariin, an active natural ingredient from the Chinese plant Epimedium sagittatum maxim against corticosterone-induced apoptosis were examined in primary cultured rat hippocampal neuronal cells. Pre-treatment of neuronal cells with icariin suppressed corticosterone-induced cytotoxicity in a dose-dependent manner. Terminal deoxynucleotidyl transferase-mediated deoxyuridine triphosphate (dUTP) nick-end-labeling assay (TUNEL) labeling demonstrated that icariin significantly reduced TUNEL-positive cell numbers induced by exposure of cultured neurons to corticosterone. Moreover, icariin markedly inhibited corticosterone-induced mitochondrial dysfunction, including improved mitochondrial membrane potential and inhibition of caspase-3 activation. Using western blot analysis, corticosterone activated p38MAPK, extracellular regulated kinase 1/2(ERK1/2) ,and c-jun N-terminal protein kinase 1(JNK1) ,while icariin blocked p38 MAPK, but not JNK1 or ERK1/2. Pharmacological approaches showed that the activation of p38 MAPK plays a critical role in corticosterone-induced mitochondrial dysfunction and apoptosis. Taken together, the present results suggest that the protective effects of icariin on apoptosis in hippocampal neuronal cells are potentially mediated through blockade of p38 MAPK phosphorylation.” Again, the role of inhibiting the P38 MAPK pathway is emphasized. Besides providing neuroprotection, icariin may promote neurogenesis in humans. Icariin has an effect on regulating the innate imune system. Icariin may be immunoregulatory for patients with allergic rhinitis. Icariin may delay aging or postpone the onset of age-related diseases. So, the IGF1, IIS and FOXO/DAF-16, pathways are also affected by icariin administration,. This is not surprising given the known relationships of these pathways to longevity. Icariin promotes the directed differentiation of embryonic stem cells into cardiomyocytes. Epimedium flavonoids (EF) can promote the proliferation and migration of adrenocortical stem cells in certain disease-model rats. Icariin promotes expression of PGC-1alpha, PPARalpha, and NRF-1 during cardiomyocyte differentiation of murine ES cells in vitro. The blog entry PQQ – activator of PGC-1alpha, SIRT3 and mitochondrial biogenesis is about PGC-1alpha, the role of exercise in enhancing its expression and PQQ, a dietary supplement that enhances the expression of PGC-1alpha. Epimedium-derived flavonoids down-regulate bone tissue breakdown and resorption (osteolysis) and upregulates bone tissue buildup (osteogenesis). Icariin has antidepressant and stress-resistance properties. Icariin-based therapy may possibly be effective in combating some forms of cancer. The 2009 publication Anti-proliferative efficacy of icariin on HepG2 hepatoma and its possible mechanism of action relates soecifically to hepatomas. “The aim of the present work was to explore the anti-hepatoma effects of icariin both in vitro and in vivo and to elucidate its potential mechanism of action. The MTT assay was applied to test the anti-proliferative effects of icariin in vitro. HepG2 bearing NMRI nu/nu mice were used to test the anticancer effects of icariin in vivo. Immunohistochemical assay and flow cytometry assay (FACS) were applied to detect the possible mechanisms of action of icariin. MTT assay illustrated that icariin inhibited the proliferation of HepG2 cells in a concentration dependent manner; meanwhile, icariin inhibited the tumor growth in HepG2 bearing NMRI nu/nu mice. The tumor weight was inhibited by 55.6% and tumor volume was inhibited by 47.2%. Icariin did not influence the spleen and body weights or blood parameters. Immunohistochemical analysis indicated that the expressions of both CD31 and Ki67 in the icariin treated group were significantly lower than those in the control group (p < 0.01). FACS assay showed that icariin dramatically decreased the percentage of CD4+ and CD8+ cells in bone marrow and CD19+ cells in blood on day 8. On day 17, the percentage of CD8+ cells in blood was lower than those in the control group. CD4/CD8 ratio in icariin group was significantly elevated in bone marrow on day 17. Icariin showed anticancer efficacy both in vitro and in vivo. The possible mechanism of action could be related to its anti-angiogenesis and anti-proliferative effects in tumors.” Of course there is a long path from an in-vitro study like this one to establishing a safe and efficacious clinical anti-cancer treatment. Along with quercetin, astragaloside IV, and ginsenoside, icariin may produce Cytochrome P450 drug interactions in a dose-dependent manner. The Cytochrome P450 superfamily (officially abbreviated as CYP) is a large and diverse group of enzymes involved in drug bioactivation, metabolism, transport and clearance. P450 interactions may be among drugs or, as discussed here, among drugs and natural substances, or among natural substances themselves. Epimedium may provide a means for overcoming male erectile dysfunction exploiting the same biological mechanism of action used in popular drugs like Viagra® and Cialis®. The 2010 publication Erectogenic and neurotrophic effects of icariin, a purified extract of horny goat weed (Epimedium spp.) in vitro and in vivo reports: “Aim: To evaluate the penile hemodynamic and tissue effects of ICA in cavernous nerve injured rats. We also studied the in vitro effects of ICA on cultured pelvic ganglia. Methods: Rats were subjected to cavernous nerve injury and subsequently treated for 4 weeks with daily gavage feedings of a placebo solution of normal saline and Dimethyl sulfoxide (DMSO) vs. ICA dissolved in DMSO at doses of 1, 5, and 10 mg/kg. A separate group underwent a single dose of ICA 10 mg/kg 2 hours prior to functional testing. Functional testing with cavernous nerve stimulation and real-time assessment of intracavernous pressure (ICP) was performed at 4 weeks. After functional testing, penile tissue was procured for immunohistochemistry and molecular studies. In separate experiments, pelvic ganglia were excised from healthy rats and cultured in the presence of ICA, sildenafil, or placebo culture media. Main Outcome Measure: Ratio of ICP and area under the curve (AUC) to mean arterial pressure (MAP) during cavernous nerve stimulation of subject rodents. We also assayed tissue expression of neuronal nitric oxide synthase (nNOS), eNOS: endothelial nitric oxide synthase (eNOS), calponin, and apoptosis via immunohistochemistry and Western blot. Serum testosterone and luteinizing hormone (LH) were assayed using enzyme-linked immunosorbant assay (ELISA). Differential length of neurite outgrowth was assessed in cultured pelvic ganglia. Results: Rats treated with low-dose ICA demonstrated significantly higher ICP/MAP and AUC/MAP ratios compared with control and single-dose ICA animals. Immunohistochemistry and Western blot were revealing of significantly greater positivity for nNOS and calponin in penile tissues of all rats treated with ICA. ICA led to significantly greater neurite length in cultured specimens of pelvic ganglia. Conclusion: ICA may have neurotrophic effects in addition to known phosphodiesterase type 5 inhibiting effects. So there we have it: icariin significantly increased sexual activity by the rats who consumed icariin and it may work through mechanisms in addition to inhibition of PDE5. I have made epimedium the center point of my own anti-aging program — because of the powerful rejuvenating effect it has on a wide variety of stem cell types. I’ve been experiementing with different brands and have found the “Planetary Herbals” brand to be particulary potent. This is a full spectrum formula containing all the major active components, with a high Icariin content. I have essentially the same opinion about Ashwaganda. In my view, it’s no coincidence that Horny Goat Weed and Ashwaganda are ingredients #3 and #2 in Sierra Science’s Product B, a purported telomerase activator. I continue to take product B daily, along with additional Planetary Herbals Horny Goat Weed and Planetary Herbals Ashwaganda. Again, great job with the article Vince. I continue to enjoy reading your terrific blog. First of all, thank you for your passionate committment to exploring what is so. And personally, your suggestion of a brand is appreciated. And yes, I have been taking Aswagandha for years now too as well as epimedium. I have mainly seen the benefits of these herbs as due to activation of Nrf2 and suppression of NF-kappaB. It is entirely possible and even likely that a downstream consequence of those actions is telomerase activation and lengthening of telomeres. So I am not sure we really have a fight on our hands. I appreciate your opinion about telomerase activation though I know you have disagreed. I promise to keep my mind open and will have another look at the whole question with respect to these two herbs. It is fascinating that epimedium and ashwagandha are key ingredients of SS’s Product B. And than you for uptting me onto Icarin. Have you seen my latest blog entries on Adaptogens and Andrographis? And there will be one later today on Rhodiola. Thanks, I agree with you on most everything you’re saying here. Some points in particular that I agree on: the importance of using these various herbs to activate Nrf2. Where I do have some difference of opinion is on how exactly a weak telomerase activators may be operating to produce health effects in humans. I feel the main benefit is in telomerase’s ability to induce stem cell differentiation/proliferation INDEPENDENT of any effect on lengthening telomeres. Arguments about whether telomere length correlates with various disease states have thus become somewhat irrelevant to me in deciding whether or not to take an activator — because I take the activator primarily to improve the health of my stem cells, regardless of whether it lengthens stem cell telomeres (or any other cell’s telomeres for that matter). I would suggest the following self experiment. 10 caps of product B per day (the same dose Bill Andrews has stated that he personally takes) or 8 caps of 1200mg Planetary Herbals Horny Goat Weed per day. (1) major improvements in skin quality all over my body, particularly on the palms of my hands/feet and in the delicate skin under my eyes. (2) complete stoppage of my receding hairline, and no more hair accumulating on my brushes and clogging the drain of my shower. completely stopped use of rogaine, no longer needed. (3) not a single cold or infection in 12 months, despite several experiments trying to make myself sick by exposing myself to others with colds/flus to test how much stronger my immune system has really gotten. (4) increased size of several moles, getting larger in the beginning and then stabilizing in size with continued use. It’s really hard for me to attribute these 4 changes to anything but telomerase, particularly the effect telomerase independently has on stem cells (e.g. skin stem cells, and hair stem cells). The reason I attribute the effect to telomerase’s independent effects on stems cells is the SPEED at which I started experiencing these changes: within about 3 weeks after starting the protocol. If these effects were happening only because my telomeres were getting longer, I’d expect to have to wait much longer. But immediate increases in stem cell proliferation/differentiation should be noticable very quickly, in perhaps weeks or even days. The permanent nature of the changes makes it hard for me to believe that transient phenomena (e.g. blocking NF-kappaB could be responsible). If such transient effects were responsible, I’d see the benefits disappear after I stop taking the pills — but after stopping for 1 full month, I saw no such regression (but also no continued improvements). See specifically sections , , and .